........We're not talking beer and wine glasses here, but about delightful shaped and coloured fanciful unique artful concepts. 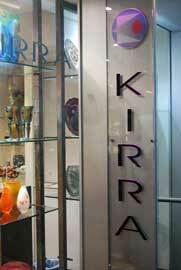 Kirra’s range features one-off pieces and limited editions by some of Australia’s finest contemporary artists. Kirra's been fostering relationships with Australian artists and nurturing younger local talent for 25 years. 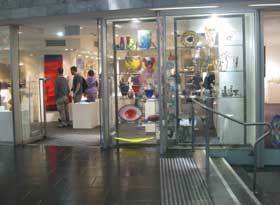 They have regular exhibitions ensuring a new experience every month or so. .........I've been in half a dozen times to look around and have never seen any staff actively trying to sell things. No photographs are allowed though hence my rather poor quality photos. Don't be fooled, its definitely worth a visit. You'll find Kirra in The Atrium at Federation Square. It's open daily from 10am - 6pm. Check out where Federation Square is on the map below. Click the blue writing beneath the map for a better look. .......And while it's not exactly art, the free Federation Square Tour is good, showing you how this amazing square was constructed (did you realise it's been formed like a trampoline above the railway lines?) and the tour provides a lot of interesting Melbourne history like how the site used to be a mortuary and how/why the particular design was chosen and what it's supposed to represent.